I am an active member of Alexandra Headland Surf Club and a Masters Surfboat rower. I have had two Great Uncles that served in PNG during WW2. I first trekked Kokoda in 2009 and became inspired by the story of Kokoda. I have walked the track 17 times since then as a guide. 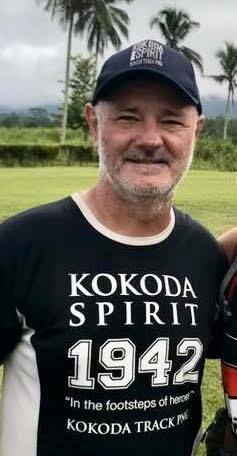 I am passionate and respectful to our Australian History and believe every Australian should have the opportunity to experience first hand the legend of Kokoda. I pride myself on my knowledge of the history of the track and the battles leading up to and after the Kokoda Campaign. I have conducted numerous short treks into the heartland of Kokoda researching some of the lesser known stories of the Kokoda campaign. I have trekked the Northern Beaches and completed some private solo treks where we mapped remote battlefield tracks. My passion is to continue to research the history of WW2 conflicts that occurred in and around PNG and, continue to lead powerful and life changing treks across Kokoda.